Glamorgan have signed 21-year-old Middlesex seamer Harry Podmore on loan for the first six 2016 Championship games. He will be fast bowling cover while Glamorgan youngsters Ruaidhri Smith and Jack Murphy have university exams. 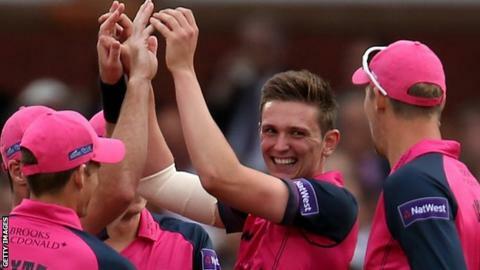 Podmore has played 13 T20 matches and six limited-overs games for Middlesex over the last two years. He has yet to appear in first-class cricket and said joining Glamorgan is "ideal" for gaining experience. Podmore is the third Middlesex bowler to spend time at Glamorgan in three seasons after Welsh product James Harris and Tom Helm appeared for the county in 2014. Glamorgan are expected to add another seam bowler to their squad before the start of the season. The county recently re-signed all-rounder Craig Meschede on a three-year contract after a successful 2015 spell on loan from Somerset. Glamorgan chief Hugh Morris told the club's website: "He (Podmore) is a bright, young fast bowling talent who will add depth to our seam bowling department, which is an area we identified as needing strengthening." Podmore said: "With limited opportunities available to play red ball cricket here (at Middlesex), this is an ideal way for me to not only gain invaluable experience in this format of the game, but also to hopefully help Glamorgan get off to a good start in their own Championship campaign." Meanwhile leg spinner Nathan Sowter, 23, and all-rounder Martin Andersson, 19, have signed one and three-year contracts with Middlesex respectively.